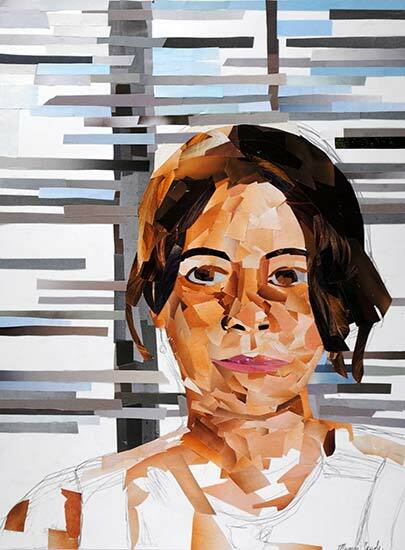 Megan Coyle’s “Samantha” portrait collage was on display in Belk Galleries. The show was run by and exhibited the artwork of senior art students. A select few artists were chosen for this exhibition, where they displayed one or two pieces of their artwork. The show had work that ranged from representational to abstraction and included two-dimensional pieces as well as three-dimensional sculptures and ceramics. 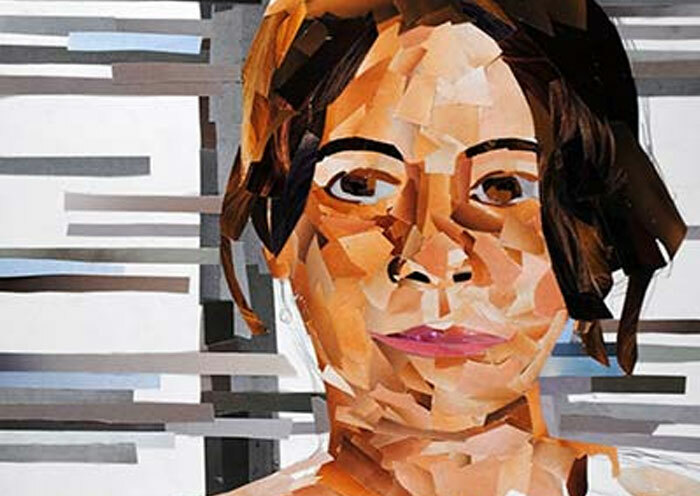 Megan created her collage portrait, “Samantha,” specifically for this exhibition. It gave Megan a chance to continue exploring the human form after completing the portrait study for her senior thesis exhibition. From the beginning of the school year, senior art students met with a committee of professors to develop their ideas for their senior thesis exhibition. 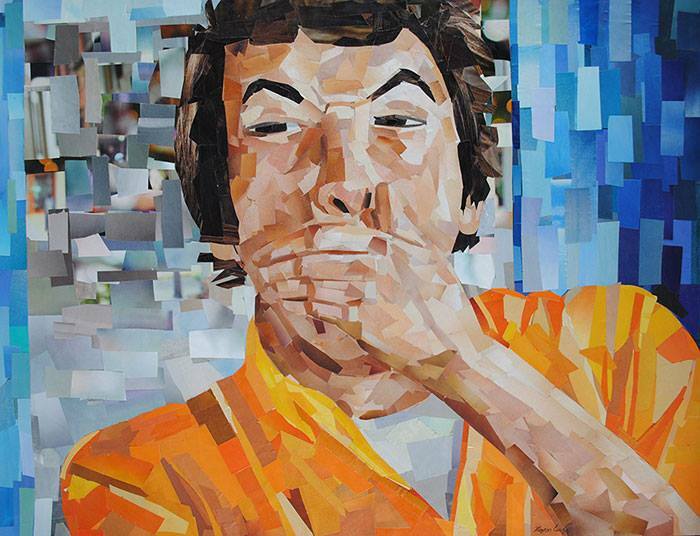 Megan worked on six collage portraits where she went through a process of intense editing for each one. This was Megan’s first cohesive body of collage work. The senior exhibition featured the work of eleven artists who worked in a variety of media, including photography, ceramics, collage, and installation. The artists didn’t limit themselves to the media they studied—for instance, Megan was a painting major and she exhibited collages (although her collages have a heavy painting influence). Megan Coyle’s senior thesis artwork was on display in Elon Arts West Gallery. Her thesis included the following collage portraits: “Benjamin,” “Jean,” “Bill,” “Bren,” “Scott,” and “Ali.” The exhibition lasted two weeks before it was taken down to make room for the second senior art exhibition. I associate the people I’m close to with scenes in my mind, with memories and places that illustrate their personalities. By bringing together the human form, and the associations that illustrate these people, a conversation is created between the work and its viewers. The narratives form a story that others can imagine in their minds. Each setting was made specifically for each sitter, relating to what kind of person he or she is. For each portrait, the setting, shadows, everyday objects, and sitter’s expression, represents each figure’s personality as I see it. The variations in the developed surface have reminded me of the complexities of the different planes and areas of muscles on the human face. Thus collage works well in communicating the variety of forms and values seen when looking at people. The art show gave senior art students a chance to showcase artwork that represented their entire body of work for that year. Megan created a series of six collage portraits for her senior thesis, where she went through an extensive process of editing each collage. For the “All Senior Art Show,” she wanted to display a piece of art that represented her collage process. 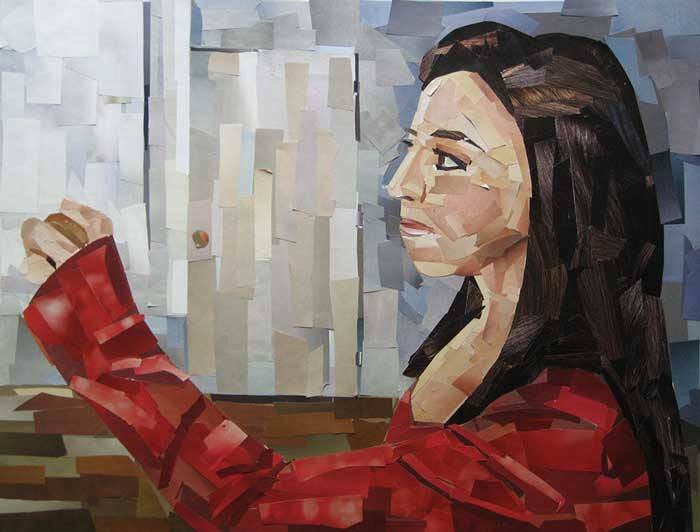 “Figure in front of Window” does just that—the collage has a partially finished look which emphasizes the shape of the magazine cut-outs that have been glued down. The original paper that the magazine cut-outs are on shines through a bit, as well as parts of Megan’s underlying sketch that was done before she started collaging. 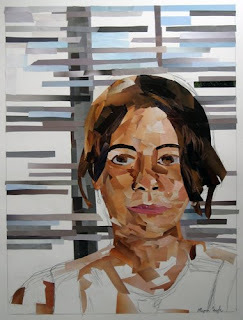 The portrait shows the transition of moving from a rough sketch to a representational collage portrait.